(CNSNews.com) - California ranks No. 1 among the 50 states for the percentage of its residents 25 and older who have never completed ninth grade and 50th for the percentage who have graduated from high school, according to new data from the Census Bureau. Texas ranks No. 2 for the percentage of its residents 25 and older who have never completed ninth grade and 49th for the percentage who have graduated from high school. 9.7 percent of California residents 25 and older, the Census Bureau says, never completed ninth grade. Only 82.5 percent graduated from high school. 8.7 percent of Texas residents 25 and older never completed ninth grade, and only 82.8 percent graduated from high school. California and Texas—while having the highest percentages of residents 25 and older who never finished ninth grade and the lowest percentages who graduated from high school—are the nation’s two most populous states. 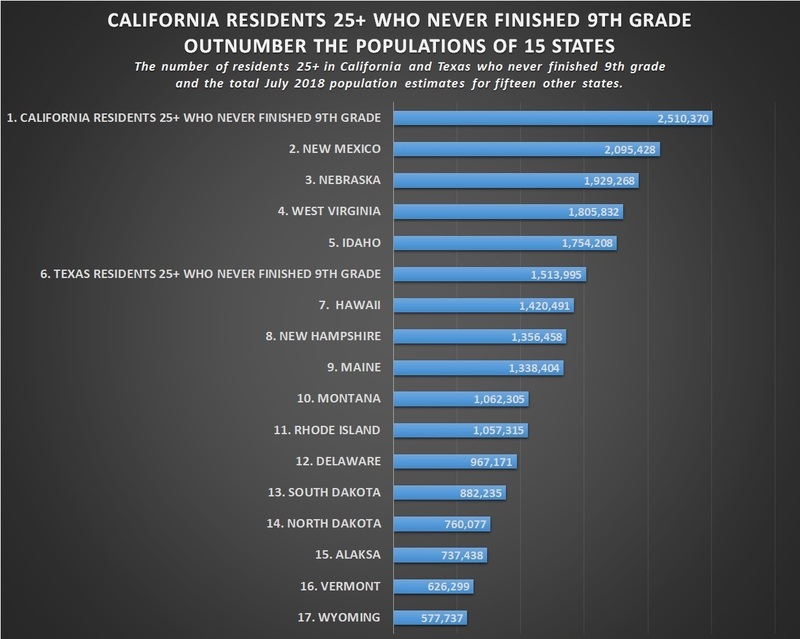 In fact, the 2,510,370 California residents 25 and older who, according to the Census Bureau, never finished ninth grade outnumber the entire populations of 15 other states. Massachusetts ranks No. 1 for the percentage of its residents 25 and older—42.1 percent--who have earned at least a bachelor’s degree. These rankings are based on data from the Census Bureau’s American Community Survey 5-year estimates, which were released this month. The Census Bureau’s American Community Survey queries a random sample of more than 3.5 million U.S. households each year and publishes a one-year estimate for each year. The five-year estimate, the bureau says, “is a weighted average of the five one-year estimates.” The newly released five-year estimates are for the period from 2013 through 2017. Nationwide, 5.4 percent of residents 25 and older have never finished ninth grade, according to the latest five-year estimates. Ten states exceeded the nationwide level of residents 25 and older who have never finished ninth grade. These include: California (9.7 percent), Texas (8.7 percent), New York (6.5 percent), New Mexico (6.5 percent), Kentucky (6.1 percent), Nevada (5.9 percent), Arizona (5.9 percent), Mississippi (5.6 percent), Rhode Island (5.5 percent), and Louisiana (5.4 percent). Wyoming—with 1.8 percent—had nation’s smallest percentage of residents 25 and older who never finished ninth grade. In seventeen states, the percentage of residents 25 and older who at least graduated from high school was less than the nationwide percentage of 87.3 percent. These seventeen states included: California (82.5 percent), Texas (82.8 percent), Mississippi (83.4 percent), Louisiana (84.3 percent), New Mexico (85 percent), Kentucky (85.2 percent), Alabama (85.3 percent), Arkansas (85.6 percent), Nevada (85.8 percent), West Virginia (85.9 percent), New York (86.1 percent), Georgia (86.3 percent), Tennessee (86.5 percent), South Carolina (86.5 percent), Arizona (86.5 percent), North Carolina (86.9 percent), and Rhode Island (87.3 percent). Nationwide, 30.9 percent of residents 25 and older have a bachelor’s degree or higher. In nineteen states, the percentage with a bachelor’s degree or higher exceeds the national percentage. These nineteen states include both No. 14 California (32.6) and No. 9 New York (35.3), which respectively ranked No.1 and No. 3 for the percentage of residents 25 and older who never finished ninth grade. The ten states with the highest percentage of residents 25 and older who earned a bachelor’s degree or higher are: Massachusetts (42.1 percent), Colorado (39.4 percent), Maryland (39 percent), Connecticut (38.4 percent), New Jersey (38.1 percent), Virginia (37.6 percent), Vermont (36.8 percent), New Hampshire (36 percent), New York (35.3 percent), and Minnesota (34.8 percent). West Virginia—at 19.9 percent—has the lowest percentage of residents with a bachelor’s degree or higher. In another seven states, the percentage of residents who have a bachelor’s degree or higher is less than 25 percent. They are: Mississippi (21.3 percent), Arkansas (22 percent), Kentucky (23.2 percent), Louisiana (23.4 percent), Nevada (23.7 percent), Alabama (24.5 percent) and Oklahoma (24.8 percent). In California, according to the Census Bureau’s five-year estimates, the resident population 25 and older was 25,950,818. Of those individuals, 2,510,370—or 9.7 percent--never completed ninth grade. Another 2,033,160 California residents 25 and older completed the ninth, tenth, eleventh or twelfth grade—but did not earn a high school diploma. Thus, a total of 4,543,530 California residents 25 and older—or a nation-leading 17.5 percent--have never graduated from high school. Those 2,510,370 individuals 25 and older in California who never finished 9th grade outnumber the entire populations of 15 other states, according to the Census Bureau’s latest population estimates. These include: Alaska (737,438), Delaware (967,171), Hawaii (1,420,491), Idaho (1,754,208), Maine (1,338,404), Montana (1,062,305), Nebraska (1,929,268), New Hampshire (1,356,458), New Mexico (2,095,428), North Dakota (760,077), Rhode Island (1,057,315), South Dakota (882,235), Vermont (626,299), West Virginia (1,805,832), and Wyoming (577,737). In Texas, the resident population 25 and older was 17,454,431. Of those individuals, 1,513,995—or 8.7 percent—never completed ninth grade. That outnumbers the populations of 11 states.